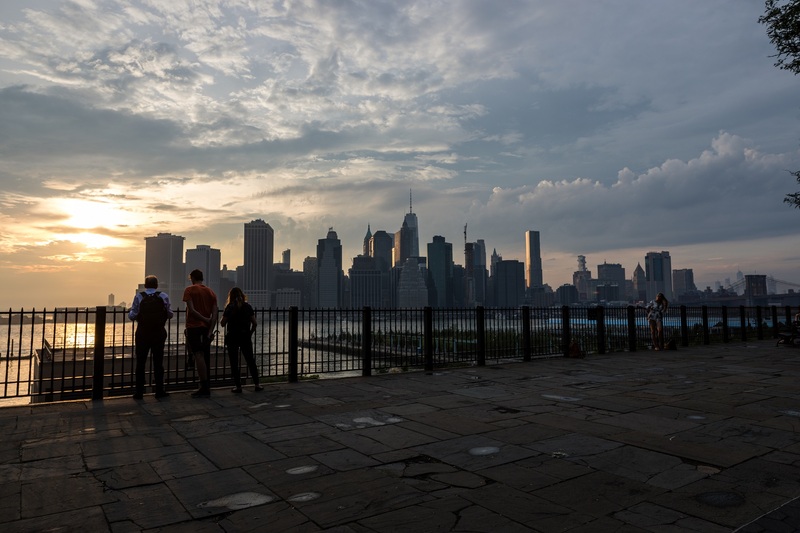 A new BQE panel created by the city will examine options for the replacement of a 1.5-mile section of the decrepit highway that supports the Brooklyn Heights Promenade. Mayor Bill de Blasio made the announcement just hours before a 7 p.m. town hall expected to draw hundreds in Brooklyn Heights. De Blasio received a tsunami of criticism after backing a controversial proposal from the city’s Department of Transportation to run a temporary BQE bypass over the Brooklyn Heights Promenade for a minimum of six years during construction. Residents of the Heights were livid over the plan, which would bring the noise and pollution of 153,000 vehicles a day up to street level. Since then, several other proposals have been submitted by a variety of civic groups and private citizens, and DOT has been reduced to repeating that they would consider each realistic proposal submitted. The uproar, which included rallies, meetings, letter-writing and PR campaigns and threatened lawsuits, threatened to derail the entire process. The city said the panel will evaluate the submitted proposals and the underlying project assumptions. Advocates say the city imposed unnecessarily restrictive assumptions, such as the necessity to confine the reconstruction project to city-owned sites, rather than collaborating with the state on siting. The panel will also consider no-build or reduced-capacity options, such as the Regional Plan Association’s recommendation to turn the current six-lane interstate into a smaller, four-lane highway. Their study was released Tuesday. The BQE panel will be chaired by Carlo Scissura, president and CEO of The New York Building Congress. Scissura is the former president of the Brooklyn Chamber of Commerce. Roughly 15 panel members have been announced, with more names to come. Members have expertise in the areas of urban planning, engineering, construction, traffic modeling and historic preservation, according to the city. “The BQE is a lifeline for Brooklyn and the entire city — which is why we are bringing in a panel of nationally renowned experts from a range of fields to vet all ideas and make sure we get this right,” de Blasio said in the release. The Brooklyn Heights Association and a new group called A Better Way NYC have been the central driving forces behind community activism and outreach, sponsoring numerous meetings and campaigns to get the city to back off the Promenade Highway idea. The Cobble Hill Association also voiced approval of the panel. “The CHA is relieved to hear the community and other stakeholders will engage with an expert panel to discuss the entire impact along the entire corridor of the BQE rehabilitation/rebuild. Our concerns in Cobble Hill remain — no through traffic on our local streets, safer on and off ramps at Atlantic Avenue and better quality of life with less toxins in the air and more green space to enjoy the views and gain safe access to the waterfront,” said Amy Breedlove, CHA president. Elected officials also voiced approval of the panel, saying it presented an opportunity for a project design do-over. State Sen. Brian Kavanagh said the panel is an opportunity to “reset the conversation” between the city and its communities. “I commend the de Blasio Administration’s decision to take a step back, take in innovative ideas, and take on the best solution that is environmentally sound and supported by our neighbors,” Brooklyn Borough President Eric Adams said. Assemblymember Jo Anne Simon and Councilmember Stephen Levin also expressed approval of the panel, as did Regina Myer, president of the Downtown Brooklyn Partnership. The panel is expected to conclude the process by this summer. The formal environmental process for the BQE reconstruction will take these recommendations into consideration when it begins at the end of 2019, the city said. To see the full panel as announced so far, see here.